The aged and sheddy cat needs a lot of looking after. I’m of the opinion that she should be made to clean up after herself, though. Think about it. She hates the vacuum cleaner. I could take a small canister vaccum, rig up a little harness, and affix it to the cat. She would run in terror when it was switched on and careen around the house, vacuuming as she went! Problem solved! The humans are so unreasonable. I see a problem, I propose a solution, and right away, without even giving it a try, they shoot it down. 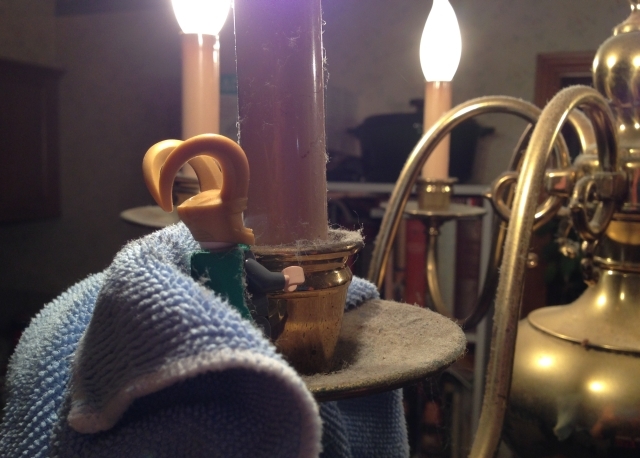 So, still without my beloved Gungnir, I find myself cleaning up after the cat. She is a confirmed litter-kicker. How she can kick litter pellets out of a hooded box with a door is beyond me. Thus, sweeping. These little pellets are quite hard and unpleasant to step on when barefoot. 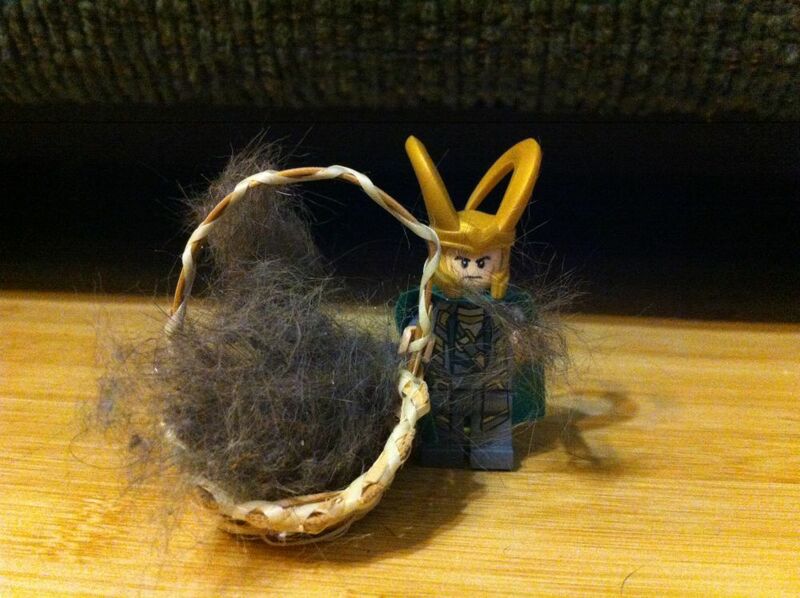 I think I will leave a few by the human female’s bedside tonight. I have also been tasked with “doing something about all the cat fur.” The cat, though ostensibly short-haired, is nonetheless possessed of a truly deluxe coat, and gray fluff does tend to accumulate. 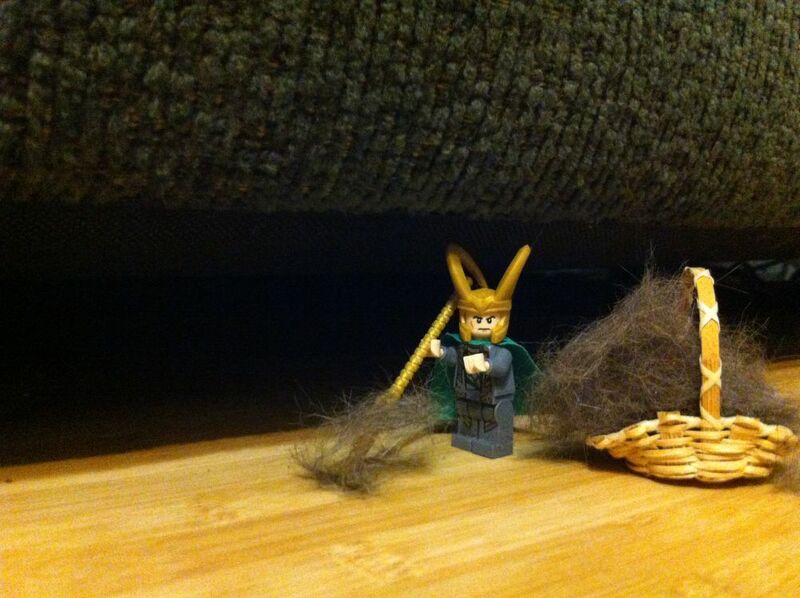 So I will gather it all up in my little basket, making sure to get every stray wisp. And make sure that it is evenly distributed under every piece of furniture. 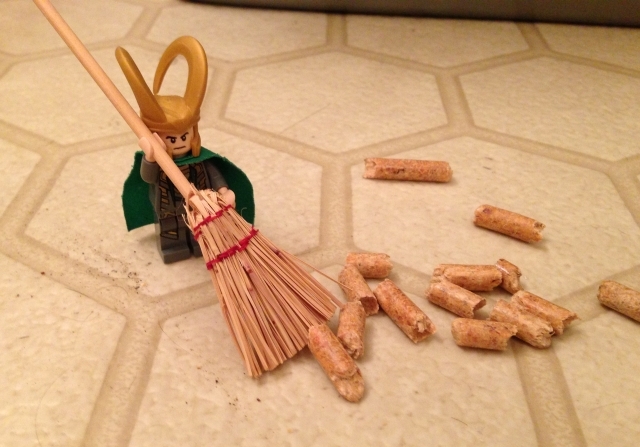 I think I hate dusting most of all the chores I have undertaken so far. Knowing that what I’m shooing and wiping is really just a microscopic mix of Midgardian epidermis and dust mite bits makes me want to lose my lunch. What’s worse is that the human female is making me dust all the places she can’t reach (which are legion), starting with the chandelier in the dining chamber. This is disgusting! Just look at the cobwebs! Are they perhaps ranching spiders up here?! Bleargh. Sticky spider-dust is the worst. While I’m up here, I think I will loosen half the bulbs and tickle the others so that one blows out each of the next three times the lamp is lit. Achoo! Dusting woodwork is a little more satisfying because you can see where you’ve been. Ugh! I am definitely being punished. I cannot think why, unless perhaps it is because last night I summoned what store of weather-working magic I have and arranged to have just enough cloud cover to obscure the lunar eclipse which the humans wished to view. Thus, today, the human female says I my job is to clean up the bathing chamber. 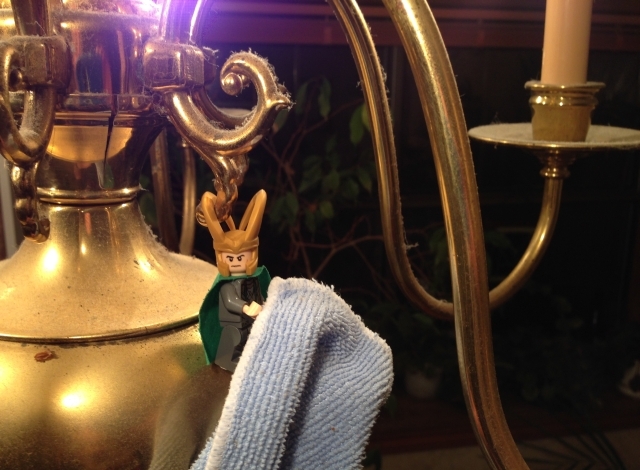 I really did not wish to become this intimately acquainted with Midgardian hygiene. Wipe the toothpaste splatters off the mirror. Eew! How do they get toothpaste on the mirror? How is that even possible? I mean, the distribution pattern is stunning in its breadth, but how hard is it to just spit the foam down the drain? Last job is to wipe down the counters. This is not hard to do, because the lazy humans buy canisters of disposable wipes in a cleaning solution, all ready to go. Most convenient. 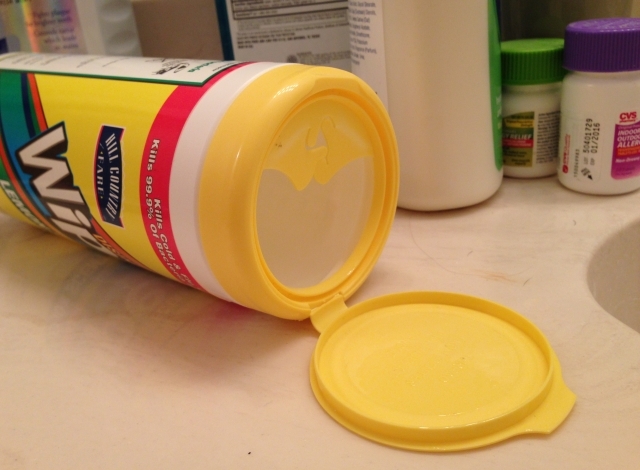 It’s only irksome if someone uses the last one and just leaves the empty container. By Odin’s puckered bellybutton! Look at all the nasty bits and pieces around the vegetable bins! Bleargh! And, might I add, Eew! Wouldn’t it be easier simply to buy a new fridge? Ehehehehehe. I just now noticed–there’s another one of my peanut butter jars back there! While I’m in the neighborhood, I think I’ll pop into the bin and slimify some carrots and celery. There’s a fine line between moist and crisp and sludgy-slick. Sometimes all they need is a good nudge. There. 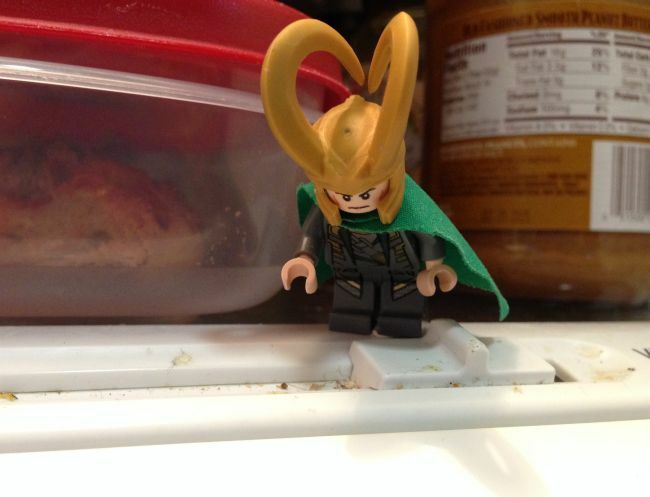 The fridge is much cleaner now. I took everything out, wiped down the walls, de-stickified the shelves, ferried spoiled produce out to the compost heap, and euthanized whatever that furry green thing in the bottom of the cheese drawer was. Time to put all the groceries back in, adding my own special touches. See this juice? Well, it used to be juice, the 100% juice juice. Bing! 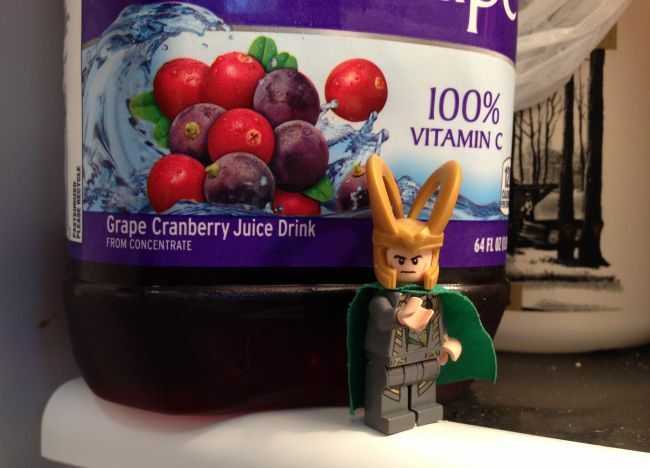 Now it is 64 ounces of “juice drink,” which means it tastes like a cross between cough syrup and purple magic marker. 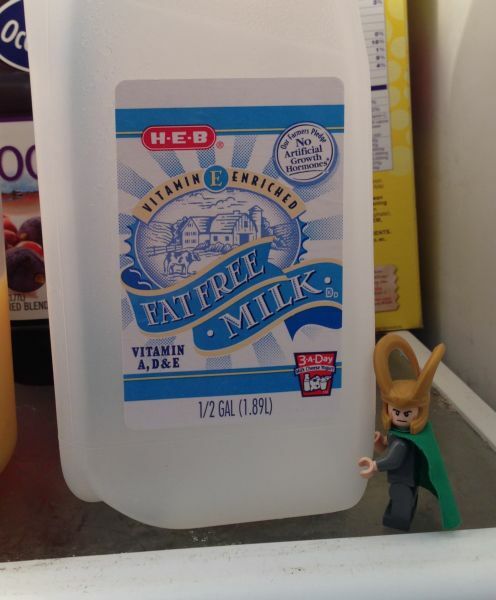 I put the milk back too. What? No, I did NOT put back an empty jug. I would never do that. It is not empty. There are twelve molecules of milk left in there. Grumble, grumble, grumble. The human female has hidden Gungnir and refuses to give it back until I help with the housework. 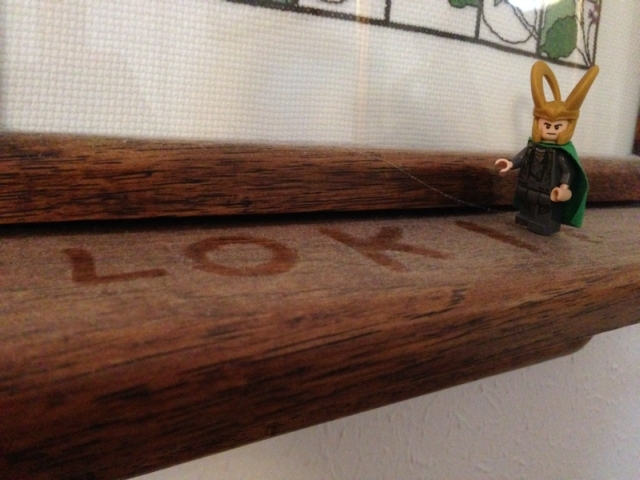 Unfortunately, I can’t call it the way my ox of a brother whistles for Mjolnir. She has promised to give it back when the house is sparkling. I’ve half a mind to… No, I suppose I will have to at least appear to help. She has decided I’m to start with the laundry. I am not allowed to run the washer, because reasons, so I have been dragooned into folding. 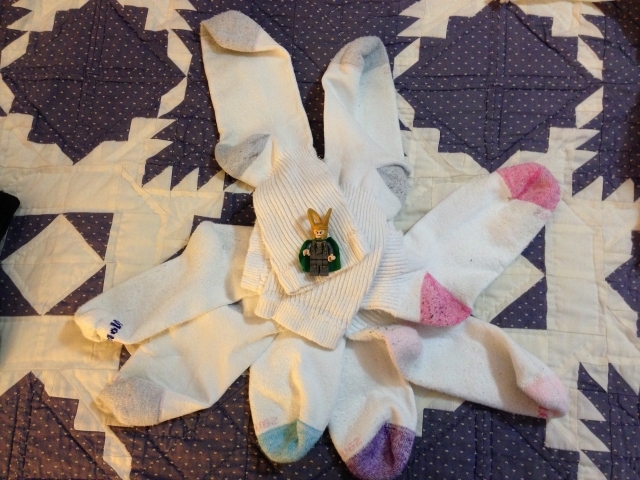 I shall start with the socks. 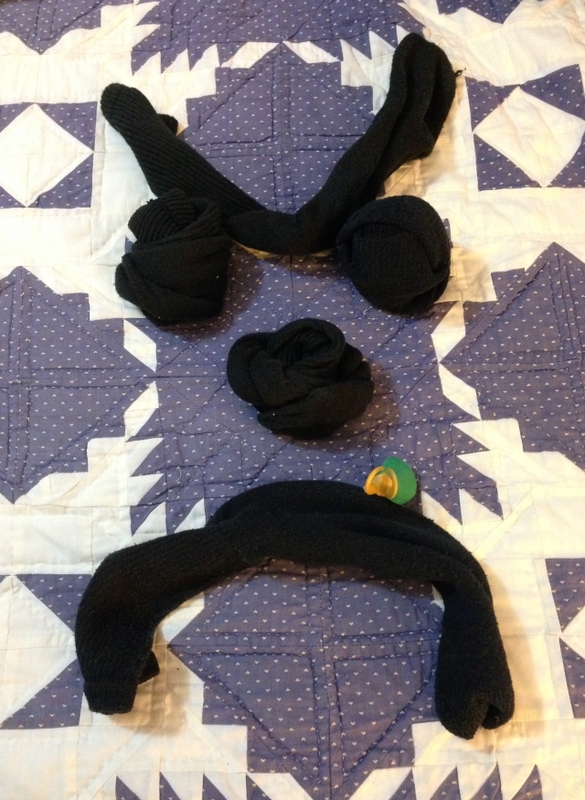 She is correct–it is very easy to pair the socks up just the way they should go. Oh. 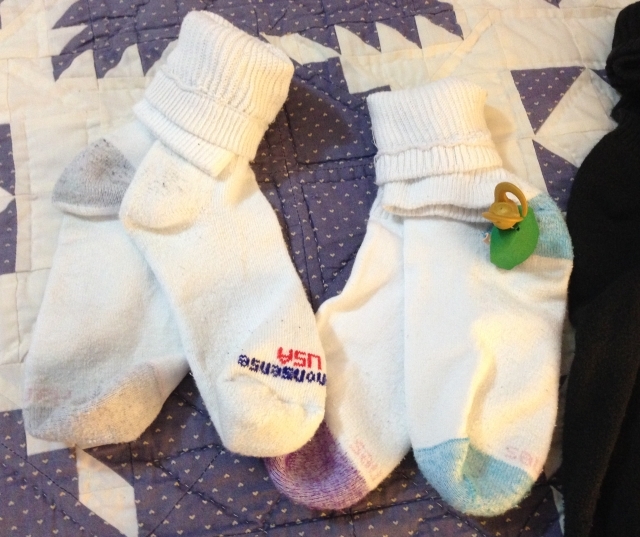 I have been relieved of sock duty. Imagine that. Underwear is next? 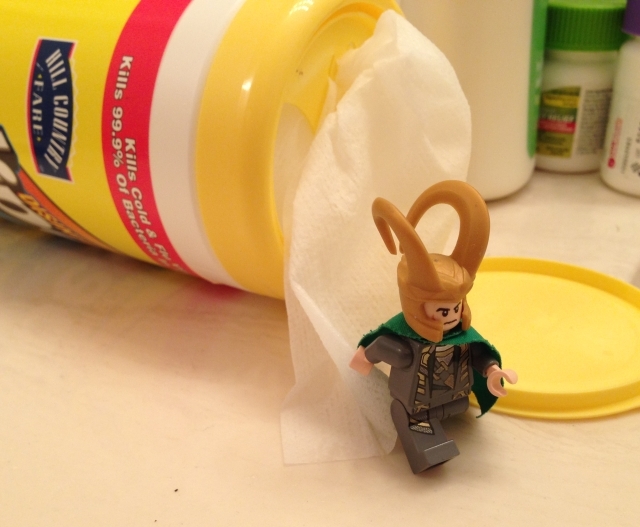 I’m supposed to handle Midgardian UNDERWEAR?! No way. I’m not that desperate for Gungnir yet! The human female is a woman of great contradiction. On the one hand, she likes a clean, tidy house. On the other hand, she’s as lazy as they come. She has made of slacking an art form. She comes home from work each day and it’s straight into the “comfy pants” and precisely nothing is accomplished. Oh, every now and then she resolves to do better–to be more organized, to get up a little earlier and get a head start on the housework, to have her home look a little more like a magazine and a little less like an episode of Hoarders. It’s not as if she doesn’t have help. The human male has been known to do laundry, wash dishes, and take out the garbage. They’ve tried to enlist the feline’s help, but the only thing she contributes to the household is cat dander and an attitude. –What’s this? She’s cackling like a lunatic and shoving a piece of paper under my nose. Oh, lady, no. No, and nuh-uh and nein and nyet, with nope sauce and heaping helpin of no way on the side. 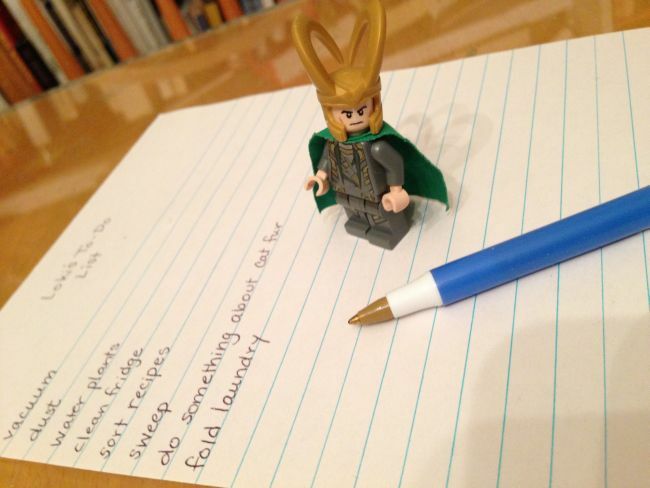 I am a Jotun Prince, the rightful King of Asgard, and a god. I am no man’s menial, and I dont. do. chores. 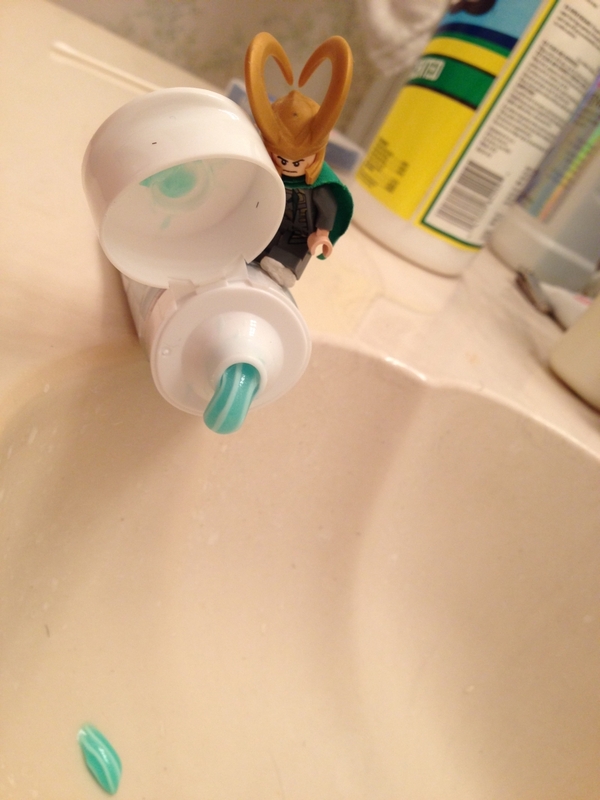 My brilliance and my skills and my magic are meant for conquering worlds, not the scrubbing of toilets. I spit on your list. 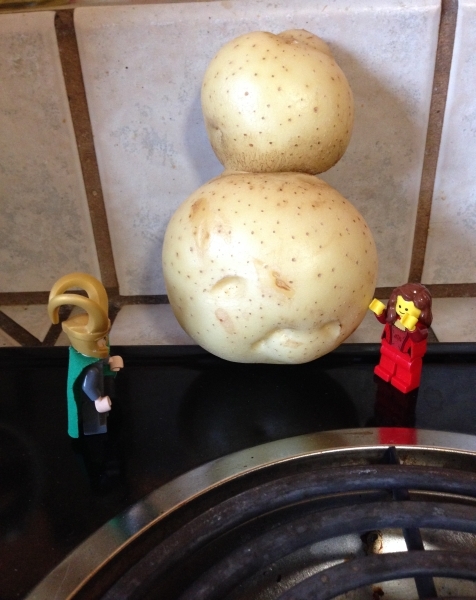 This odd potato the human male picked up at the market is making me want to sing.